Hong Kong Blockchain Week,HKBCW, is taking place from March 4-8. The core events are the Block O2O Global Summit (March 5-6) and the Hybrid Summit (March 7) at AsiaWorld Expo, Hall 3. Free shuttles will be provided to reach Asia World Expo. There will be a sizable expo with exhibitors from across the blockchain, corporate and crypto spectrum. 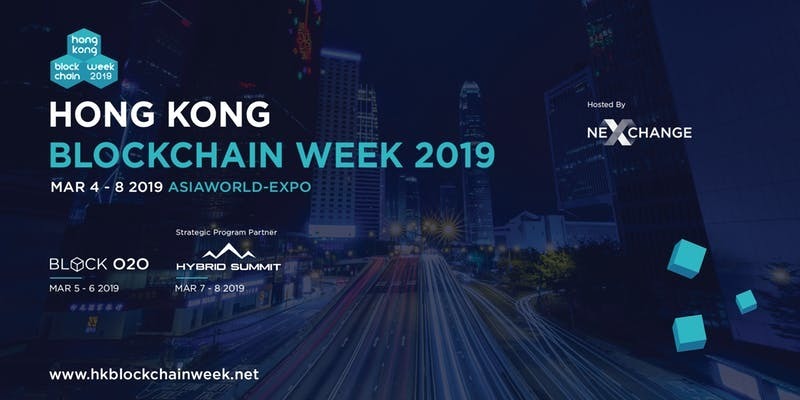 NexChange is the host for HKBCW, we have a tremendous track record producing large scale technology events including Fintech Week 2016, Fintech Week 2017, Healthtech 2018 and now (to come) Healthtech 2019 and Hong Kong Blockchain Week 2019; and Hybrid Block, operators of an all-in-one cryptocurrency trading system founded by two-time Olympic gold medallist Apollo Ohno, is the Strategic Partner producing Hybrid Summit. The Block O2O Global Summit will be more enterprise in focus, covering major themes including the enterprise use of blockchain across all industries but especially financial services, trade finance and logistics, security, government services and underlying technology platforms. Case studies of actual blockchain uses will show the way for the next generation, provoking and answering questions about how governance and regulation will work. The BO2O Global Summit is backed by major government departments, quangos and industry associations that form the core of Hong Kong’s financial services and technology community.